We all know of the Tun Razak Exchange or TRX, for short, or better known as the Exchange 106, will surpass the Petronas Twin Towers as the tallest building in SEA soon but do you know there’s another building that’s making headlines all over the news? The M101 SkyWheel us part of the M101 series of buildings in the heart of Kuala Lumpur that consists of 10 buildings that are developed with interesting and rather futuristic designs. For every development by M101 Holdings, there will be ‘M101’ in the front of the name of the project. 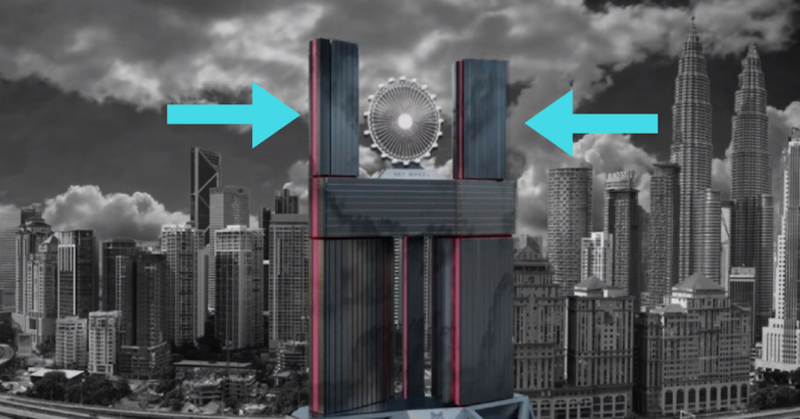 One of the most unique features of M101 SkyWheel is the fact that it will host a Ferris wheel that will be 220 meters above ground on the 53rd floor – said to be first in the world. Not only that, once it’s done, it’s the highest Ferris wheel in Southeast Asia. It will also have an underground train station. Expected completion is in 2021 and an amazing view of KL skyline can be viewed from the 60-meter tall Ferris wheel that’s designed by the same designers of the London Eye and Singapore Flyer. According to The Star, this 78-storey project is estimated to be about RM2.2 billion, designed by Studio F.A Porsche. Once completed, it will have one of the world’s highest shopping center with a SkyMall that’s more than 200,000 square feet and Asia’s first Planet Hollywood Hotel. Furthermore, it is an all-in-one integrated commercial and retail development that features SoFos, sky retail, roof top pool as well as lifestyle amenities and more. This is rather a bold step and an interesting design for a building situated in a location that’s known for having a lot of tall infrastructures. What do you think of M101 SkyWheel? Does KL really need another building?